Recently, I have been studying the works of a writer called Parker Palmer. Parker is a teacher who has become world famous communicating some “truths” of how to teach effectively. As much of what we do as project managers falls into an educational category, I am learning a lot from him. 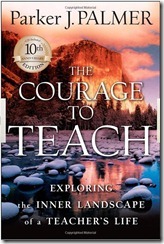 A great read for all project managers is a book called The Courage to Teach. The importance of community and how we insert and assert ourselves within it. While Palmer talks of this in terms of educational communities, it is easy to see how every project has it’s own community and behavior. Understanding and adapting to each community is a case study for many projects I have been involved with over the years. Being authentic. Having integrity and identity are important characteristics if our team in going to know and trust our judgment. Palmer describes this as being authentic in our dealings with others. Losing control actually gains control. While not advocating insurrection in the classroom, Palmer describes how important it is to immerse yourself completely into the class and the environment created by each study group. This is very applicable to project management, where not handing over control to team members to contribute can dramatically impact results; in both a positive and negative way.